It has only been a number of days since the timetable for the signature and ratification of the envisioned trade agreement between the EU and Canada was agreed upon − and parts of it are already outdated. Instead of vocal support for CETA, the agreement is in high danger of failure and might as well end with a blank piece of paper. The fact that a failure of CETA would also imply a deadly blow to the common trade policy of the EU is ignored. What is the way out of this self-imposed existential crisis? What does it mean for Europe’s representative democracy if the wave of public outrage breaks over CETA? The legal basis is unambiguous. The member states have transferred exclusive competence over trade negotiations and trade agreements to the European Union. In response to public pressure, the European Commission decided to involve national parliaments in the decision-making process. In consequence, CETA can enter into force only upon ratification by the 28 member states according to their respective national ratification procedures. Prior to that, the competent European Institutions, first and foremost the European Parliament as well as the Council, must cast a positive ballot. However, the agreement fails if CETA is rejected in one single member state. The misinterpreted concession of the Commission yields EU members veto powers, which present us with a dilemma: member states have no authority to negotiate trade agreements and block the efforts of the EU to do it on their behalf. Two conclusions, short and long-term, could be drawn: First, CETA − the most advanced trade agreement ever negotiated by two parties − would fail. Second, we would give up on shaping globalisation. Other trade powers would set the standards for the future of international trade. CETA-critics forget all too often that trade has played a vital role in building Europe’s prosperity. The advantages of the common market are universally accepted and appreciated. The common trade policy of the European Union has contributed significantly to this wealth. Europe is the largest trade power in the world. Regarding CETA, Europe could be in a position of strength. Instead, we have to ask ourselves: With whom will Europe be able to enter into agreements if the EU is not capable of negotiating an agreement with close partners, such as Canada? Who will ever want to conduct negotiations with us at all? If the ongoing debate around CETA ends with the principal inability of the EU to conclude trade agreements, future trade negotiations will have to be conducted separately. One strand of talks for those policy areas falling under the exclusive competence of the EU and a second set of negotiations for all those policy areas falling under national competence of the member states. Both strands of talks would lead to separate trade agreements. Thereby, the danger of a blockade, such as with CETA, would be averted since ratification by member states would not constitute a requirement for EU trade agreements to enter into force. The agreements could fail individually without holding the entirety of trade policy hostage. Trade partners would have to be aware that the agreements would not come as package deals, but would mutually reinforce one another in case both were adopted. This scenario is a second-best solution only when it is measured against a genuine common trade policy. The alleged “democratisation” of trade policy by otiose involvement of national parliaments would have buried the still-existing common trade policy. However, the proposal to conduct trade negotiations separately offers a way out of this self-imposed existential crisis. It would not repair all damage, but it constitutes a pragmatic approach in line with the overall goal of trade negotiations: Enhancing and strengthening economic exchange and trade to secure Europe’s prosperity. In one sentence you imply that the individual countries have no right to stop CETA beyond the right given to them when the EU said individual parliaments had to ratify the deal. Later you acknowledge competences do exist that remain with national governments. All the EU has to do is stick to negotiating the competences it does have control over. Take any text that encroaches on national powers out of the deal. Sign the rest. 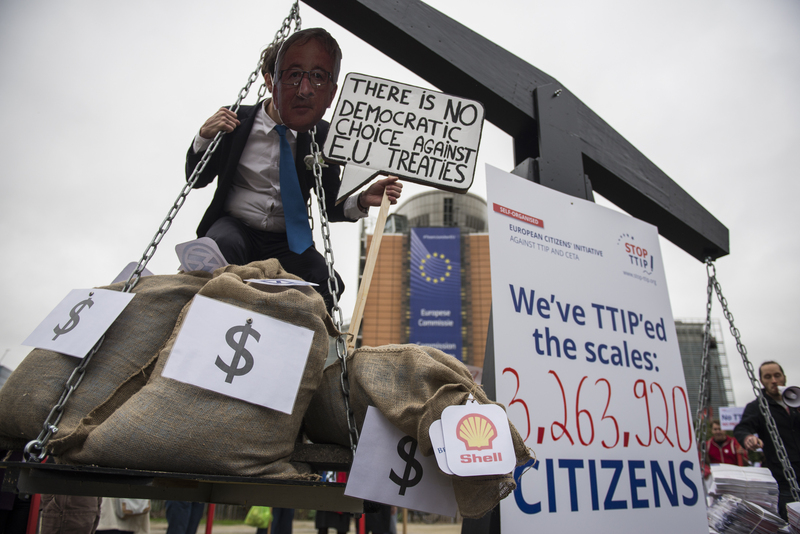 If CETA was a trade agreement, there would be no need to ratify it in national parliaments. The Lisbon treaty gives the EC right to directly negotiate purely trade treaties and ratify them in the EP. But it is a mixed agreement. It is mixed because DG Trade decided to include political components that encroach upon the rule of law, services offered by the state, health, environmental and labor rights that have as much to do with trade as geography or language. The investor-privileges chapter mysteriously popped up in the negotiations an year after the start of the talks. So it is not Europe, but the trade bureucracy that has forfeited credibility by proposing what amounts to an act of capitulation before investors. And the right-wing politicians are the biggest fools, because small and medium businesses will be swept from the market by US multinationals (85% of big business in Canada). “Other trade powers would set the standards for the future of international trade.” This is an interesting statement considering that there are similarities between the CETA and the TTIP in that most of the trade-related, not political agenda driven, areas are already dealt with under bilateral and unilateral agreements.between the involved parties. It can a legitim question if the CETA treaty really is needed or will have any clear noticeable _positive_ effect on trade or employment. Another item to note is that in both cases (CETA and TTIP) there is quite substantial opposition by politicians and people in general (democracy!?!) in Canada and the USA to these treaties. This aspect should not be forgotten in this discussion. What I do like in this article is the clarification, not proposal, of how EU already works – with a clear separation of the competencies and its impact on the process fro progression on this type of proposed treaties. It is not the trade deals, that arouse so much opposition, as all the the financial conditions coupled with it. Investor protection, the possibility of suing governments, if legislation impares the profit, a special court to handle diagreements etc. Giving such undemocratic control to the corporations i not acceptable, it seems that EU is working at constricting the importance of the national parliaments! The EU is creating the problems themselves. Work for the people, with the people, not for the Neokapitalistic regimes.